Oh blogging buddies, how I have missed you! As those of you with school aged kids know May is a crazy month filled with soccer games, school plays, Mother’s Day, field trips, and in the Afthead house, the little Afthead’s birthday. In preparation for the big birthday party this weekend we stopped by Costco for some party food: popcorn, candy, and wait a second…what is that? Across from the popcorn was a big paint bucket that said “Food Storage”. Always looking for a better solution to plastic bags and Ziploc containers I had to check it out. After reading a bit I realized that this bucket did not hold what I thought it held. 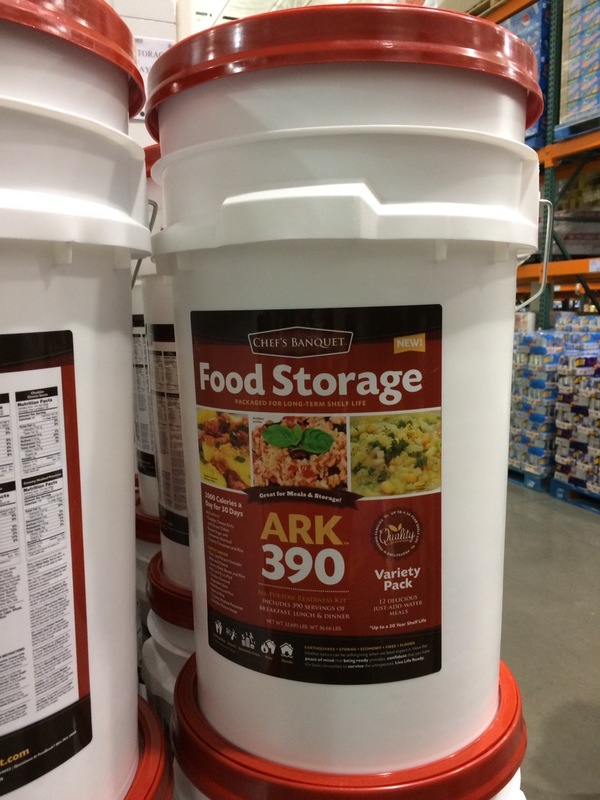 This bucket contains 390 “delicious just-add-water” meals. When enjoyed eaten these meals will supply the family of four 2000 calories per day for thirty days, and the contents are good for twenty years! Wow, so many questions before I purchase though… First off, I calculate that a family of four eating three meals a day for 30 days needs 360 meals. Since this has 390 meals I wonder what the extra 30 meals are for? Picky eaters? A snack every fourth day? That mutant rat that snuck into the emergency shelter with you? Can you have a family of five eat for 10 days and then pick who doesn’t get to eat the rest of the time? With a family of three, we could eat for 43 days, unless those random extra meals are important somehow. What a deal! Next, there is the highly touted “Gamma Lid” featured in the Costco online write up. I don’t know why a Gamma Lid is important or what it does for your bucket-o-food, but man, I feel like more of my buckets need a Gamma Lid. Mother nature can be unforgiving when we least expect it. Have the peace of mind that being ready provides, confident that you have the basic necessities to survive the unexpected. Live Life Ready. Whoa there. Let’s all start singing the old Sesame Street song, One of these things is not like the other… Is anyone else aware of a Mother Nature derived economic disaster? Maybe a tornado ripped through the Federal Reserve? I had to watch the video online to get clarification, but that just played peppy music and showed me a happy lady with a white chunky necklace making some “Creamy Cinnamon & Rice” from the bucket. I also got to see her twist open the Gamma Lid! Based on the video, I also think the meals come with garnish like lemons, parsley, sour cream, fresh strawberries, jalapenos and whipped cream. Yum! Whoa, oh, oh, oh, oh….Come on, sing along if you watched the video! Well, I didn’t buy the bucket, because my husband and child dragged me away from the display before I could really understand bucket’s worth, but with all my additional online research I may just have to join chunky necklace lady and plaid shirt man (who appears on Costco’s site stocking his shelves with what appears to be a tenth bucket) in “living life ready.” Mmmm….tomorrow I think I’ll twist open my Gamma Lid and enjoy some Cheddar Cheese Grits with Green Chilies, Chicken Flavored Vegetable Stew and Creamy Mashed Potatoes! Oh! They didn’t mention the zombie apocalypse, so I’m not sure if it’s appropriate for that disaster. Maybe though. Does Mother Nature cause the zombie apocalypse? You so beat me to that one. And: As for a “natural” zombie apocalypse, It depends on the type of situation that presents itself. Some are natural, like from rabies, say;-), or they could be caused by humans messing about with the genome. Oh dear. My husband has a bit of a prepper mentality (that I repay with rolling eyes). Thank goodness we don’t have a Costco nearby. I haven’t seen this in Sam’s Club yet, but if they start selling it, he will be sure to want a few (dozen). Post-its and duct tape. With these two items any catastrophe can be overcome. Can you trade in the relish for a roll or two of tape? Wait. Dill or sweet? If it’s sweet that is just sick and wrong, but dill might be worth something. Ok so there I was, after a long period away, going back through my blog reader to catch up when I came across this site. “Afthead?” I asked myself. “What the hell is Afthead? Why am I following this site? I don’t know who this person is!” Naturally, I clicked on over to the blog to do some sleuthing of my own and see if this person was anyone I actually knew, who maybe changed the name of their site, or that I just forgot about while I was away for so long. Nope. No idea who this person is. However, while reading this person’s blog post on Costco’s answer to survival, I found myself quite giggly, and enjoying the read very much. So then I realized this Afthead was just some random blog I came across that is written with so much wit and humor and skill I decided to follow it, despite having no personal connection to the author. Welcome, welcome new reader. I don’t know how you found me, but I love your comments, so come back anytime. Isn’t it great to find new random blogs? Now off to peruse your world, but first I’ll make myself some just-add-water grits to fill-ish my belly. Mmmmmm…. Hurricanes, earthquakes…but no mention of “political elections”??? Because whoever wins, someone’s threatening to go off the grid…. This is true. Maybe the label was printed before this election cycle started? Man, I would really enjoy eating emergency ration mac and cheese while watching some stomach churning debates once the general election really gets going! Oh! Peanut butter! Great addition! Bravo!! !